If you're going to get caught with your hand in the cookie jar,you might as well do it UGLY. 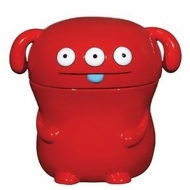 Now you can relive your favorite Uglydoll snack moments with the all new Uglydoll ceramic line! Cookie jars to hide your favorite cookies, mugs for your favorite beverage, cups so you can have some more, and coin banks to keep your "time to buy more cookies" coins in.